KPMG is a global network of professional firms providing Audit, Tax, and Advisory services. We operate in more than 156 countries and have 152,000 people working in member firms around the world. The independent member firms of the KPMG network are affiliated with KPMG International, a Swiss cooperative. Each KPMG firm is a legally distinct and separate entity and describes itself as such. 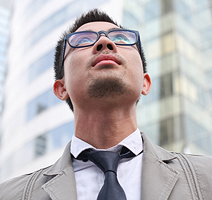 KPMG in Thailand prides itself on the broad and expansive thinking of its professionals. As a result of this, we have been able to provide sound and valuable business advice to help clients manage their business risks, as well as to grow and succeed in Thailand�s competitive and rapidly-evolving business arena. KPMG in Thailand has a wealth of local knowledge and skills, the benefits of which are delivered to clients by a team of over 1,000 professionals and staff. Our local knowledge is enhanced by international links to the pool of technical and industry skill resources within our global network. This helps us to get even better results as we consistently strive to achieve the highest standards and quality of service. We are a high performance culture and look for like-minded people who embrace challenge, can work in a team but also seek continual individual improvement. We are client focused and look for those who are able to manage work responsibilities while delivering quality and making an impact.